At Mouquet Farm 35 Brigade, 12th Division is holding the ground near Ration Trench when it is attacked at 03:00 and again at 07.30 on both flanks. The main body holds off the attack but on the right the 5th Royal Berkshire Regiment pulls back. At 09.20 the 15th Australian Infantry drives the Germans from Park Lane and enters 0G1. The failure of 7th Suffolk Regiment on the Australian’s right to retake Ration Trench means that the Australians have to withdraw back to the line of the Farm track. XIII Corps launches a two division assault on Guillemont and the area east of Waterlot Farm. 6 Brigade, 2nd Division attacks north of the railway. 1st King’s Liverpool Regiment attacks Guillemont Station with three companies reaching their objective. The fourth company finds the German front lines reoccupied. Lieutenant Colonel Charles Edward Goff MC (commanding 1st Liverpool Regiment) is killed at age 26. Second Lieutenant John Theodore St Clair Tisdall (Liverpool Regiment) is killed at age 23. He is the brother of Sub Lieutenant Arthur Walderne St Clair Tisdall who was awarded the Victoria Cross on Gallipoli in April 1915 and who was killed the following month and they are sons of the Reverend William St Clair Tisdall Vicar of St George’s Deal. Second Lieutenant Lancelot Andrew Noel Slocock (Liverpool Regiment) is killed in action at age 29. He is an English International Rugby football player and his brother will die of wounds in April 1918. His Noel middle name came from the fact he was born on Christmas day. He is the son of the late Reverend F H Slocock, Rector of Mottisfont. Second Lieutenant John Reginald Swallow (Liverpool Regiment) is killed. He is the only member of the staff of Southgate Country School to be killed in either World War. Private John William Greenhalgh (Liverpool Regiment) is killed at age 29. He is the second of three brothers who will die in the Great War, the first died in April 1915 while the last will be killed in 10 days. Private Wilfrid Chaloner (King’s Liverpool Regiment) is killed during an attack on Waterlot Farm at age 24. His brother will die of malaria on service in 1919. From Waterlot Farm, 17th Middlesex Regiment enters ZZ Trench but fails to link up with the Liverpool Regiment. Two football players are killed during the attack on Guillemont while serving in the Middlesex Regiment. Private William Webber Walter Gerrish is killed in the attack after losing both his legs at age 31. He played football for Aston Villa from April 1909 to August 1912 and also played for Bristol Rovers and Preton NE. He scored 17 goals in 55 league matches for Aston Villa and 1 goal in 3 cup matches. Private Oscar Horace Stanley Linkson is killed at age 28. He started his career with Barnet Alston (later Barnet F.C.) in 1907. He was spotted playing for an amateur team, Pirates FC, on a continental tour by scouts from Manchester United who were also touring in the same area. He signed on as a full team player for Manchester United in 1908. He made his first team debut on 24th October 1908 in a match against Nottingham Forest. 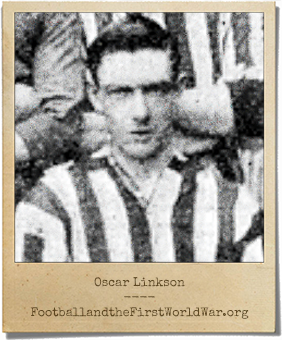 In total Linkson played in 55 league games and 4 FA Cup games. He would help the club win the 1909 FA Cup and 1911 league championship. In 1913 he transferred to Shelbourne in Dublin. In 1912 he married his 16 year-old sweetheart Olive Fenton. Olive was the granddaughter of Kate Hodson an actress in the Victorian era and the great niece of Henrietta Hodson, an actress and theatre manager. Private Thomas Alfred Clarke is killed at age 19. His brother will be killed in July 1917. Lance Corporal Frank Chandler is killed in action at age 26. His brother will die on active in February 1917. Private Allan Foster is killed at age 29. He is a football player for both Reading and Bristol City who is remembered for his hat trick against AC Milan in Reading’s 5-0 victory. 55th Division attacks Guillemont itself with two brigades-164 and 165. In 164 Brigade, 1st/4th Liverpool Regiment is stopped by barbed wire south west of the village. The Liverpool Irish (1st/8th King’s Liverpool Regiment) advances past the quarry and occupies the center of Guillemont. They are followed by 1st/4th Loyal North Lancashire Regiment, whose mission is to occupy the German line. They however are pushed back and the Liverpool Irish are surrounded in Guillemont where the survivors surrendered after 36 hours. South of Guillemont 165 Brigade sends 1st/5th Liverpool Regiment bombing along Cochrane Alley. They are soon stopped and forced back to the assembly trenches. This night ‘Castle Hill’ in Macedonia is occupied by the Worcestershire Regiment. Tonight the first of three German air raids on the Hartlepools takes place. Two bombs are dropped in a field near the districts of Foggy Furze and Longhill in West Hartlepool damaging nearby houses. Lieutenant Colonel John Plunkett Verney Hawksley DSO (commanding 110th Brigade Royal Field Artillery) is killed at age 28. Captain Edward Marmaduke Rennard (North Lancashire Regiment) is killed at age 21. He is the son of the Reverend David Smith Rennard Vicar of Heapy. Captain Francis Bernard Roberts (Rifle Brigade) is killed at age 33. He is the son of Canon W A Roberts. Captain Carlton Collingwood (South Lancashire Regiment) dies of wounds at age 26. He is the son of ‘Sir’ William Collingwood. Lieutenant Reginald John Elliott Tiddy (Oxford and Bucks Light Infantry) is killed at age 36 when a shell strikes the trench he in searching for wounded soldiers. He is a member of Cecil Sharp’s morris-dance demonstration team which will also lose three other members this year. His book The Mummers’ Play will be published in 1923. Second Lieutenant Henry Merrik Burrell Law (Royal Flying Corps) is killed at age 26. His brother was killed last September and they are sons of the Reverend Henry Kiburn Law Rector of Dolton. Second Lieutenant Ronald d’Albertanson MC (East Surrey Regiment attached Dorsetshire Regiment) killed in action at age 22. He is the son of the Reverend Canon of Rua da Cerca, Oporto, Portugal. Corporal Henry George Haskett (Somerset Light Infantry) is killed at age 30. His brother will die on service in March 1919. Lance Corporal John Cloudsdale age 24 and his brother Private Thomas Cloudsdale age 27 are killed together in the King’s Own Royal Lancaster Regiment). Private Albert Dun (South Lancashire Regiment) is killed. His brother was killed on the first day of the Battle of the Somme. Privates and brothers Edward and William Henry Nicholson (Lancaster Regiment) are both killed at age 18. Private Ernest Sidney Smith (Australian Infantry) dies of wounds at age 27. He is the middle of three brothers who will lose their lives this year. Private J Burrow (Royal Lancaster Regiment) is killed in action at age 25. He is the Assistant Master at Dalton (Church of England) School. Private James Dove (Northumberland Fusiliers) is killed in action at age 22. His brother will be killed in October of this year. Private Abel Lomax (East Lancashire Regiment) dies of wounds received in action at age 25. His brother will die of wounds in September 1917. Private Allen Foster (Middlesex Regiment) who played football for both Reading and Bristol City is killed at age 29.